At one point, someone shouted “off with his head” about Obama. And the Republican County Chairman, William Platt, asked, “Imagine if you woke up on November 5th and Barack Obama -- Barack Hussein Obama -- was our new President?” The campaign later said: “We do not condone this inappropriate rhetoric.” But that kind of rhetoric is becoming commonplace, especially at Sarah Palin's rallies. Today Joe Biden challenged her. 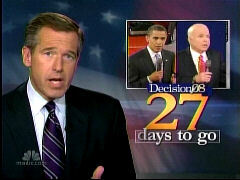 BRIAN WILLIAMS: Now, a related topic: presidential politics. And about last night, looks like 63 million of us watched on television -- more than the first presidential debate, but fewer viewers than that Biden/Palin VP debate. There were no devastating or towering moments in the Obama/McCain debate in Nashville last night. All we heard beforehand was that McCain was most comfortable in the so-called town hall format, though many viewers saw something less than that. As it turned out, two moments from last night loomed large today as the campaigns went back on the road with just 27 days to go now until the election. Our report tonight from NBC's Andrea Mitchell. ANDREA MITCHELL: In Bethlehem, Pennsylvania, today, the Republican candidate's wife, Cindy McCain, accused Barack Obama of not supporting the troops in Iraq, including her son. CINDY MCCAIN: The day that Senator Obama decided to cast a vote to not fund my son when he was serving sent a cold chill through my body. MITCHELL: In fact, Obama voted against money for the troops once in May 2007, he said, "because the bill didn't include a timetable for withdrawal." But John McCain also voted against a troop funding bill two months earlier for the opposite reason -- because that bill called for a troop withdrawal. The day after their second debate, John McCain also kept up his attack on Obama. JOHN MCCAIN: What ever happened to the tax relief he promised them when he was a candidate for the Senate? MITCHELL: Again today, the McCain crowd was rowdy. MITCHELL: At one point, someone shouted "off with his head" about Obama. 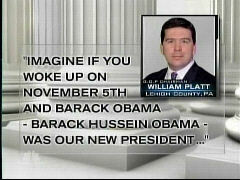 And the Republican County Chairman, William Platt, asked, "Imagine if you woke up on November 5th and Barack Obama -- Barack Hussein Obama -- was our new President?" The campaign later said: "We do not condone this inappropriate rhetoric." But that kind of rhetoric is becoming commonplace, especially at Sarah Palin's rallies. Today Joe Biden challenged her. JOE BIDEN: To have a vice presidential candidate raise the most outrageous inferences, the ones that John McCain's campaign is condoning, is simply wrong. MITCHELL: Democrats are also buzzing about McCain's debate performance last night, saying he seemed dismissive and disrespectful when he referred to Obama as "that one." JOHN MCCAIN: You know who voted for it? You might never know: that one. JOE BIDEN: When John knows that he's on the attack and he's not feeling good about it, John never looks you straight in the eye. John doesn't go and refer to you by your first name. MITCHELL: Critics also jumped on McCain for seeming to patronize one questioner in the debate, Oliver Clark, who asked what it will take to help people having a difficult time in the economic crisis. MCCAIN: Really, the match that lit this fire was Fannie Mae and Freddie Mac. I'll bet you, you may never even have heard of them before this crisis. MITCHELL: Today Obama was in Indianapolis, the first Democrat to campaign in the heart of that red state in October since LBJ. BARACK OBAMA: I can take four more weeks of John McCain's attacks, but the American people can't take four more years of John McCain's Bush policies. MITCHELL: As Republicans try to figure out how to slow Obama's momentum. 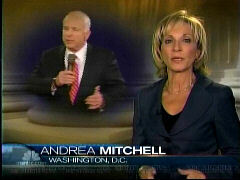 Andrea Mitchell, NBC News, Washington. A momentum the media are fueling.